Audioengine launches upgraded A5+ powered speakers | What Hi-Fi? 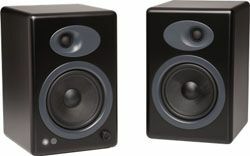 Audioengine has unveiled the A5+ powered speakers, a new model building on the existing A5 model. New features and upgrades include a pair of stereo inputs, alongside a 3.5mm input, a new improved port system and an external heat sink, which should improve performance at higher volume. The A5+ speakers come with a new remote control, full-sized 5-way binding posts and a stereo output. The speakers have built-in power amplifiers, a USB connection for charging portable devices and subwoofer outputs. As on the preceding A5s, the A5+ speakers deliver 50w per channel, sport 5in kevlar woofers and 20mm silk dome tweeters. The Audioengine A5+ speakers have hand-made MDF cabinets, are available in black or white and will retail at £299. The speakers are due out by the end of October.